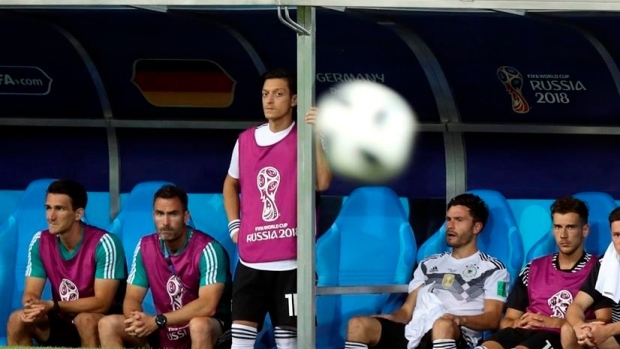 BERLIN — Mesut Ozil's angry departure from Germany's national team amid accusations of racism drew mixed reactions at home Monday, prompting both sharp criticism of the player and concern over the country's attitude toward Germans with foreign roots. The Arsenal star announced his retirement from international football Sunday, weeks after Germany's first-round World Cup exit. He attacked the German football federation (DFB), its president, fans and media for what he saw as racism in treating people with Turkish roots. "I am German when we win, but I am an immigrant when we lose," the German-born descendant of Turkish immigrants wrote, complaining that "I am still not accepted into society." Justice Minister Katarina Barley tweeted: "It is an alarm signal when a great German footballer such as @MesutOzil1088 feels unwanted in his country because of racism and not represented by the DFB." The DFB said it regrets Ozil's decision to quit and rejected being linked with racism. Ozil defended his decision to pose for photos with Turkish President Recep Tayyip Erdogan two months ago, along with teammate Ilkay Gundogan. He cited "respect" for Erdogan's office. At the time, DFB president Reinhard Grindel publicly accused the players of allowing themselves to be "exploited" for political purposes by Erdogan, who has drawn criticism for increasingly authoritarian behaviour. Some German politicians questioned their loyalty to Germany and suggested they should be removed from the squad. No top German football officials have resigned since the team's elimination last month, and some have appeared willing to make Ozil the scapegoat. Grindel has demanded that the player — who, unlike Gundogan, had remained silent — provide an "answer" on the photo. "For me, the photo was wrong, and it is still wrong, and the explanation doesn't convince me," Cem Ozdemir, a prominent politician with the opposition Greens who has Turkish roots, told Deutschlandfunk radio. But he said Ozil, in complaining that he's only viewed as German when Germany wins, "certainly speaks from the heart of a great many people with immigrant backgrounds, not just of Turkish origin." Grindel, he added, "clearly made a scapegoat of Ozil." Ozil, a member of the Germany team that won the World Cup in 2014, was far from the only player who had a below-par tournament in Russia. Germany's biggest-selling daily, Bild, took a harsher view, with a front-page headline on Ozil's "Whining Resignation." And the far-right Alternative for Germany party, which was particularly vitriolic about Ozil in recent weeks, also piled on. "With his farewell tirade, Mesut Ozil unfortunately is proving to be a typical example of the failed integration of far too many immigrants from Turkish and Muslim cultural circles," co-leader Alice Weidel said. In a statement after a telephone conference of its leadership Monday, the DFB said it is "very grateful" to Ozil, who made 92 appearances for Germany. It said it regrets that Ozil "felt that he wasn't sufficiently protected as a target of racist slogans" but it had been important for the midfielder to respond to questions about the Erdogan photos. The federation said it "very clearly rejects" being linked with racism, arguing that "the DFB has been strongly committed for many years to working for integration in Germany." A spokeswoman for Chancellor Angela Merkel, Ulrike Demmer, said that the German leader "values Mesut Ozil highly." She said he had "made a decision that has to be respected," while insisting that "Germany is an open country in which people with immigrant backgrounds are very welcome." Foreign Minister Heiko Maas cautioned against reading too much into the case. "I don't think that the case of a multi-millionaire living and working in Britain says much about integration in Germany," he told reporters in Berlin. "And in any case, the truth is on the pitch. The fact that the Germans were knocked out of the World Cup has little to do Mr. Ozil having his picture taken with Erdogan," he added. "I think everyone involved in this case should reflect. I see few people who in my perception have behaved more or less right in this case."